Have a passion for beading and want to purchase your supplies at really low, low prices? This is for you. Northern Bohemia is certainly one of the main providers of glass beads in the world. Located only about 1 hours drive from Prague, it is a perfect place to visit for those who are interested in beads and glass pearls. Not only will you see how these beautiful objects are made, you can purchase them wholesale at significant savings. The Bohemian North has always been a place where the glass pearls and beads were manufactured. The local sand is the right kind for glass making and the thick forests assured ample wood for the glass melting ovens. As some of you know, there are several kinds of glass beads. Here we have two kinds, the pressed and the hand formed beads, also known as lamp beads, the famous, excellent quality Bohemian Beads. Please note, as much as this tour is very rural, introducing you to the typical, beautiful, mountainous Czech countryside, this tour is not a sightseeing tour. It is a tour designed for people whose hobby or profession includes glass beads and pearls - the main focus of this tour. Your driver/guide picks you up at your hotel and takes you to your first destination, a goat and other small animal farm which is connected to a factory, producing pressed beads. Farming was always present next to the factories here. While one part of the family made beads, the other took care of the domestic animals and fields in order to put food on the table. Small bead pressing factories sprang up next to the farms and are still there today. 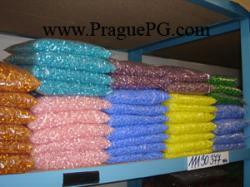 See how the beads are made and purchase them in bulk for very low prices. Have lunch in the local restaurant with real Czech food, if you like. Then it's onto the "Museum of Beads and Glass" in Jablonec if you want to go, a perfect way to introduce you to the history of bead making as well as show you some of the techniques used. Visit another factory store and another, depending on your interest. Then visit a place where the hand formed beads are made. Watch the artist make individual, hand formed beads, each being an original, a work of art. Purchase them right on premises if you like. IMPORTANT! Please note, the factories are closed on Saturday and Sunday. The museum is closed on Mondays.